Phil Wiggins & George Kilby Jr. Trio ft. Sherman Holmes – Masters of the Blues! 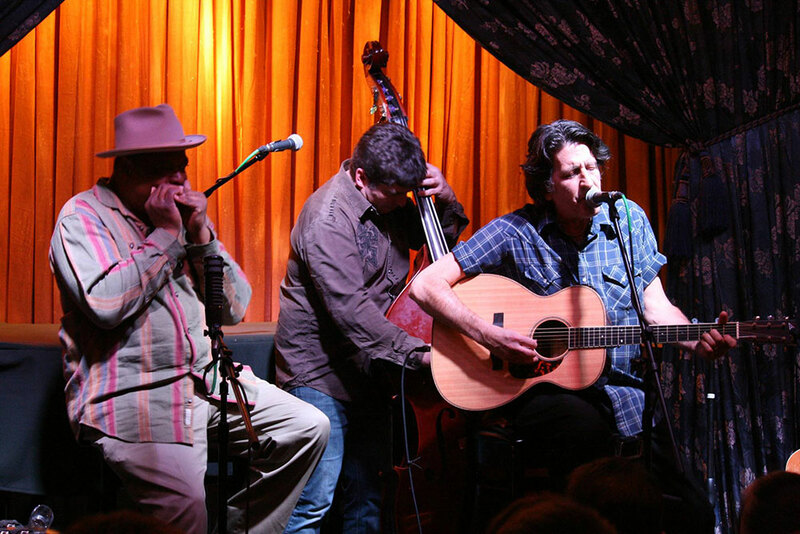 Returning to Baur’s for their second appearance is harmonica master Phil Wiggins, guitarist George Kilby Jr. and bassist Andy Calder, featuring Sherman Holmes of The Holmes Brothers. Jointly presented by Colorado Blues Society and Music Appreciation Society, this acoustic performance by the Wiggins & Kilby Jr.Trio will be a concert to treasure as these revered players deliver the down-to-earth lyrics of modern day Country Blues along with traditional tunes. The blues harp master Wiggins, the fingerpicking of Kilby Jr. and the bass/percussion of Calder with the bass/piano of Holmes will be appearing exclusively at Baur’s Listening Lounge in Denver for this very special Thursday night. 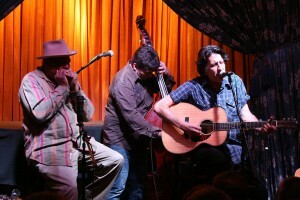 Phil Wiggins was half of the internationally acclaimed acoustic blues duo Cephas and Wiggins for 30 years. Together they made 14 albums for Smithsonian Folkways, Alligator and Flying Fish labels among others. George Kilby Jr spent 20 years playing with and producing albums for the legendary pianist Pinetop Perkins of Muddy Waters band. The two met not long after the passing of their respective musical partners; and this has resulted in a new dynamic partnership including tours and major Blues festivals in the US, Canada and Europe. Their extensive catalog of songs as well as collaborative songwriting in developing new material is the inspiration for a new record in the works. In 2013, Kilby and Wiggins recorded and released Kilby’s song “You Never See the Hand Throw the Stone” which tackles racism, religion, and corruption. The song appears on the CD Six Pack (Top Frog Music).Their current collaborative material follows this path instead of recycling old blues themes, however classic they may be. Themes such as police/race strife, forgiveness, the 2nd amendment question, and the preservation of the environment are common in the new material that Wiggins& Kilby are recording for an upcoming album. Wiggins’ honors with Cephas include Carnegie Hall, Royal Albert Hall, the White House, and a seat on the National Council for the Traditional Arts. Kilby’s honors include 3 albums with Pinetop Perkins, a WC Handy Album of the year, and countless European and US tours. Of late the pair is also doing several concerts with the legendary Sherman Holmes (of The Holmes Brothers). Blues aficionados and lovers of authentic roots music will appreciate the artistry of these World renowned proponents of the Blues traditions! Phil Wiggins blows the harmonica like nobody else playing today and with George Kilby on guitar, they are the perfect partnership to carry on their combined legacy. Please get your tickets to attend the Denver return of this important new musical partnership proudly sponsored by CBS and MAS.